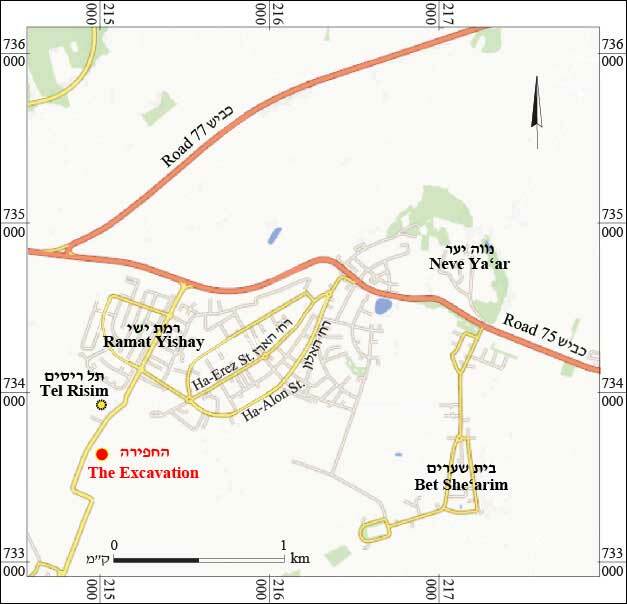 In July 2016, a trial excavation was conducted in the fields of Kefar Yehoshua‘, south of the Ramat Yishay cemetery (Permit No. A-7777; map ref. 215050/733600; Fig. 1), after ancient remains were discovered while paving a road. The excavation, undertaken on behalf of the Israel Antiquities Authority and financed by Netivei Israel, was directed by U. Berger, with the assistance of R. Abu Halaf (administration), M. Oron (flint processing), I. Delerson (plans), H. Tahan-Rosen (drawing of pottery and basalt artifacts), N. Marom (archaeozoology), M. Smilansky (flint drawing), K. Covello-Paran (ceramic consultation) and A. Shapiro (GPS and surveying). The excavation was carried out along the moderate slopes of the southern fringes of Tel Risim, also known as Tell er-Rish or Tell el-Muwajih. The mound was first identified and surveyed by the Palestine Exploration Fund (Conder and Kitchener 1881:352) and again as part of the survey of the Map of Nahalal (Raban 1983: Site 42). During the latter survey, only a scant amount of pottery sherds was ascribed to the Bronze Age; most of the finds date from the Iron Age II, Persian, Roman, Byzantine and Islamic periods. Thus far, the only excavation carried out on the tell itself was in 2001, on behalf of the Institute of Archaeology of the University of Haifa, when new burial plots were being prepared in the cemetery (License No. B-214). 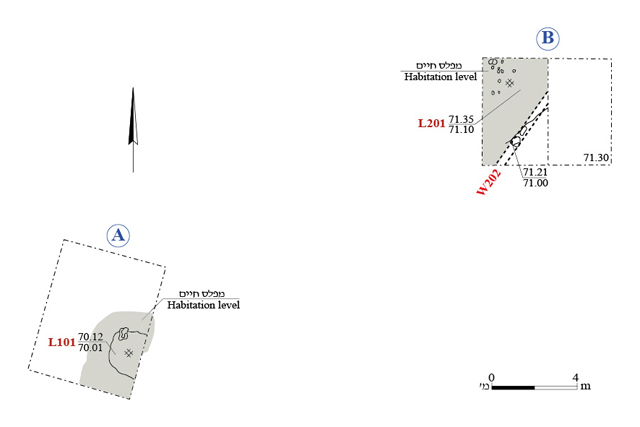 Four excavations on behalf of the Israel Antiquities Authority were conducted on the northern fringes of the tell, yielding architectural remains from the Iron Age and Hellenistic period, tombs from the Persian and Roman periods and burial caves from the Intermediate Bronze Age (Atrash 2010). Similar burial caves were exposed in an additional excavation, c. 0.75 km east of Tel Risim (Porat 2008). Two excavation squares (A, B; Fig. 2) were opened, reveling the remains of a single-period settlement from the Intermediate Bronze Age. These were poorly preserved due to agricultural activity. A trial trench (width c. 10 m, length c. 300 m, max. depth c. 2.5 m) yielded no archaeological finds. 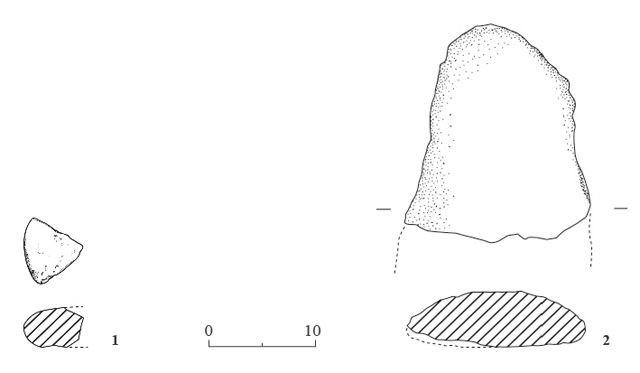 A habitation layer (L101) exposed in Sq A consisted of a tamped layer of soil with numerous pottery sherds, broken flint tools and flint flakes (Oron, below), basalt grinding tools (Fig. 3:1, 2) and animal bones (Marom, below). A habitation layer of a similar composition and nature was exposed in Sq B (L201), beside the meager remains of a stone wall (W202). Building stones scored by modern plow blades were scattered along the plowed furrows of the field. The ceramic finds uncovered in the excavation belonged mainly to bowls (Fig. 4:1–4), pots, holemouths and kraters used for cooking (Fig. 5:1–3), jars (Fig. 5:4–7) and jugs (Fig. 5:8), and included folded ledge handles (Fig. 5:9–11) which cannot be attributed with certainty to a particular type of vessel, but are quite characteristic of the Intermediate Bronze Age. 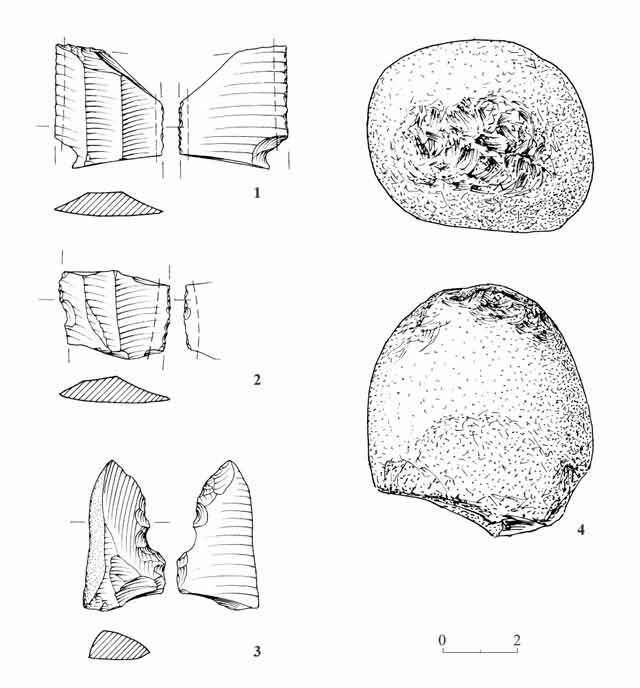 The knapped flint items (Table 1; n = 25) found in the excavation, comprised mainly of debitage (60%), mostly flakes and primary items that cannot be attributed to a specific culture or period. The assemblage includes nine tools along with a plain core with a single striking platform, which was used to produce flakes. The tools include three sickle blades: two are made on Canaanean blades characteristic of the Early and Intermediate Bronze Ages (Fig. 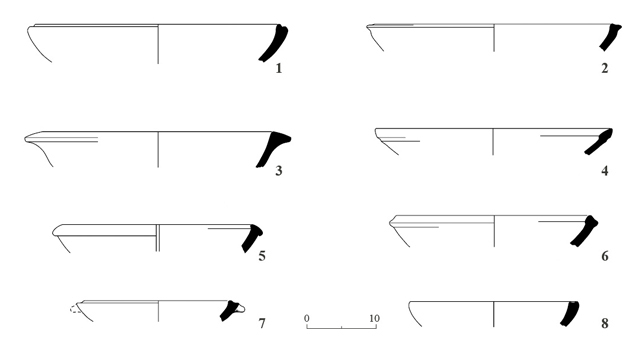 6:1, 2), and one is a fragment of a sickle blade characteristic of the Chalcolithic period (Fig. 6:3), which is probably an intrusive find. The other six tools are a drill, four denticulated items with notches (not drawn) and a stone pounder (Fig. 6:4). The pounder and the primary items indicate that the flint knapping was probably done at the site. Thirteen animal bones were found in the excavation; they were identified and measured (Von den Driesch 1976) in the archaeozoology laboratory at the University of Haifa. Cattle is the most common species, represented by six bone fragments: three teeth and three lower limb bones and phalanxes (measurements of Phalanx 1: GLpe = 58.5; Bp = 31.5; Bd = 31.39). The teeth were permanent and worn, an indication that they belonged to an adult animal. Four pig bones were found: a lower back molar, not worn and hence from a young specimen; a jaw fragment from the same basket, probably of the same individual; a skull fragment; and a metatarsal fragment (metapodial). Another broken molar was not measured, but based on its overall size it seems to be more compatible with a domesticated pig than with a wild boar. Also found were a dog’s vertebra, a small fragment of a donkey’s tibia and a fragment of a goat’s pelvis. Evidence of weathering on the pig’s jaw (L201) and gnaw marks of predators on a cattle bone from the same locus indicate prolonged exposure of the bones prior to being covered in sediment. The faunal composition — cattle, pig, sheep/goat, donkey and dog — characterizes the rural economy of the northern coastal plain during many periods. The relative frequency of the farm animals cannot be addressed due to the small sample size. The excavation, south of Tel Risim, unearthed habitation remains from the Intermediate Bronze Age. It seems that, at least in this part of the tell, the settlement was relatively scattered and sparsely populated, and construction was not dense. The inhabitants of this part of the settlement left no traces of a rich material culture. The remains found in the excavation were probably those of the people who were interred in the burial caves previously discovered at the site. The material culture unearthed at the site is characteristic of domestic assemblages of the Intermediate Bronze Age in the Jezreel Valley. Also typical of the period is the location of the site (Covello-Paran 2015): not on the tell top but rather at the foot of the tell, adjoining the valley grounds, and removed from earlier occupation remains. As such, these sites did not continue ancient habitation traditions and were not resettled in later times. Atrash W. 2010. Ramat Yishay. HA-ESI 122. Conder C.R. and Kitchener H.H. 1881. The Survey of Western Palestine II:Galilee. London. Covello-Paran K. 2015. The Jezreel Valley During the Intermediate Bronze Age: Social and Cultural Landscapes. Ph.D. Diss., Tel Aviv University. Tel Aviv. Driesch von den A. 1976. A Guide to a Measurement of Animal Bones from Archaeological Sites. Cambridge, Mass. Porat L. 2008. Ramat Yishay. HA-ESI 120. Raban A. 1983. Map of Nahalal (28) (Archaeological Survey of Israel). Jerusalem. 5. Cooking and storage vessels. 6. Flint artifacts and a stone pounder.